A "KAL" is a Knit-A-Long. Groups or individuals all work on the same pattern or patterns, sharing their experiences and supporting each other through the joy of the work. In June, The Yarn Spot will be hosting a KAL of my three new sock patterns, and I'll be hosting a virtual one here too. If you're a knitter, please consider joining in. The three patterns, Aflight, Afield, and Aflame, are for sale on Ravelry for $3.99 each, or together as a set for $9.99. 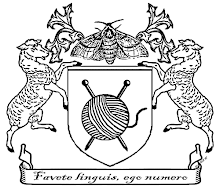 If you don't have a Ravelry account yourself, the patterns are for sale through your local yarn shop's Ravelry set up now that this feature is fully enabled; the price is the same. If for some reason you can't get the patterns through Ravelry, you can contact me privately and we can use PayPal and email. The patterns range from the simple (Aflight, with an easy to work lace cuff and then basic sock knitting) to the more complex and ever-changing (Aflame, with a tubular cast-on, twisted ribbing, and two different lace motifs one of which is formed primarily with nupps). None, though, is too complex or involves more than one knitting operation at a time. So please consider getting your needles and yarn ready and joining in!